One of my favorite snacks of all time is saltine crackers with cheese and some fruit. I don't usually buy crackers, though—they're cheap, but even cheap things add up, and they're so not good for you! I never seem to be able to justify spending a few dollars on totally empty calories. However, I'm trying to work on having more quick snack-friendly foods in my house, and so I decided to take a shot at making my own crackers. There are tons of basic recipes floating around on the internet. This is the one I used—it's super easy and very customizable. You can add herbs for a savory snack, or honey or sugar for a sweeter cracker. I also want to try adding some parmesan cheese sometime. The options are endless! I put sesame seeds on top of mine, because I love sesame seed crackers, but next time I would add them in the beginning with the flour because they do have a tendency to fall off the dough! Preheat oven to 350. In medium bowl, mix flours and salt. Mix in oil and water with wooden spoon. I found that after the oil and water were mostly integrated, it was easiest to use my hands to knead the rest of the dough together. Knead for a minute or two; dough should be supple but not sticky or wet to the touch. Divide into 3 sections. On lightly floured surface, roll dough out as thinly as possible. Transfer to cookie sheet (it sounds difficult, but it was actually pretty easy to pick the dough up and slide it onto a sheet). Repeat with other two balls. If you don't have three cookie sheets, you can do them in batches in the oven. Using a fork, prick a few holes in each cracker. Using pizza cutter or pastry roller, score or cut crackers (my original recipe said just to score them, but I honestly didn't think it made any difference whatsoever) into desired shapes. I just did squares and rectangles this time, but you could also use a cup to cut round crackers—next time I have to do a snack plate for a party, that's my plan! Sprinkle salt over dough. Bake for 10-15 minutes; when the outside edges of the dough start to turn golden, your crackers are done. The longer they bake, the drier they will be; we thought that the best time was when just the edges were golden, so the crackers in the center were still a little more moist (but crunchy). Let cool. 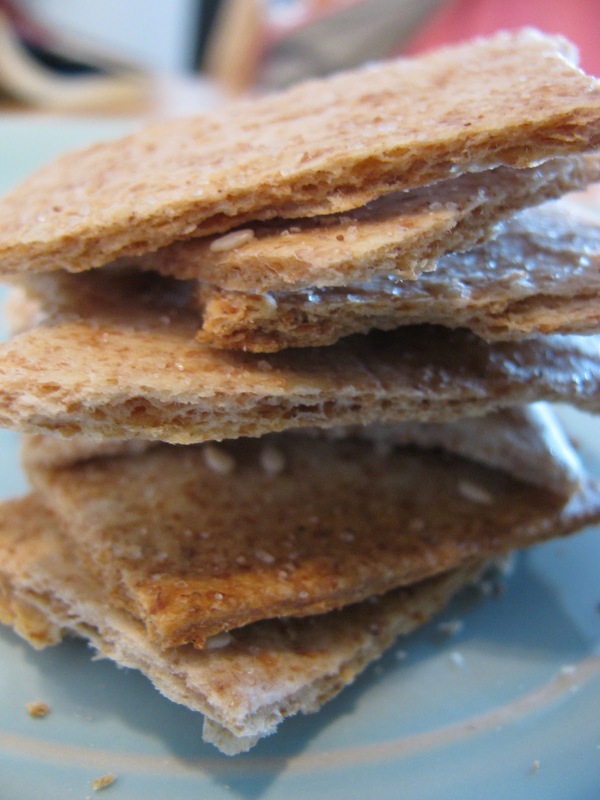 If you scored before baking instead of cutting, break crackers along scored edges. Enjoy! They are delicious with cheese and like I said, this recipe is VERY customizable. *This recipe is fine for bleached flour too. I always use unbleached because it's typically the same price, contains more of the wheat protein, and doesn't have as many harmful additives. I finally got around to making some. Yummy! I used garlic and basil on one batch and chicken soup base on the other. They were kind of like those Chicken in a Biskit crackers that I loved as a child!